Normal electricity supply has resumed. All scheduled surgeries for Tues 17th Oct will take place as originally planned. If you are unable to travel to attend your surgery or out-patient appointment on Tues 17th Oct please make contact with either the Hospital (056 7775275) or your Consultant’s secretary. Aut Even Hospital is currently on a back-up Generator electricity supply. Surgeries scheduled for Tuesday October 17th will only take place if normal electricity supply is resumed. We are advising all patients scheduled for surgery on Tuesday Oct 17th to contact the Hospital (056 7775275) or their Consultant’s secretary in order to get an update. 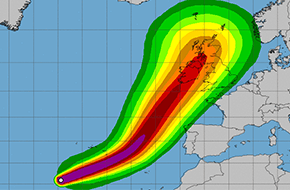 Patients who cannot or do not wish to travel to Aut Even on Tues Oct 17th for theatre or out-patient appointments should contact the Hospital (056 7775275) or their Consultant’s secretary to advise them of their intentions. All postponed surgeries and appointments will be rescheduled as priority and your Consultant will advise you on this in due course. Aut Even Hospital remains open today (Monday 16th) to in-patients and those scheduled for surgery. All out-patient appointments for this afternoon have been cancelled. We are advising that visitors do not travel to the Hospital today in order to stay safe. Patients with queries about their surgery should contact the Hospital on 0567775275 or their Consultant’s secretary.